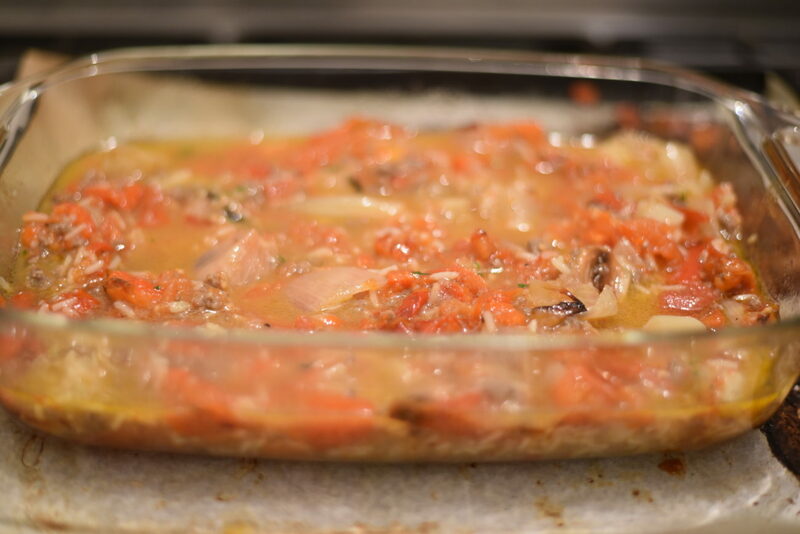 There is something very comforting about taking a vegetable filling it up with something else, giving the vegetable and its stuffing a new form of existence. 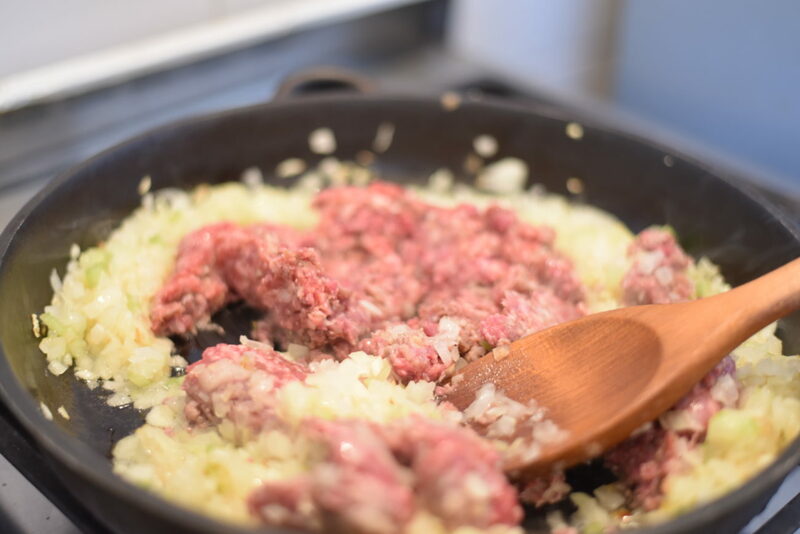 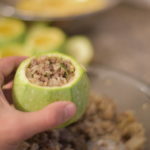 This is what’s happening when make the stuffed zucchini with ground lamb, spices and rice, creating a unique existence for both the zucchini and the ground meat. 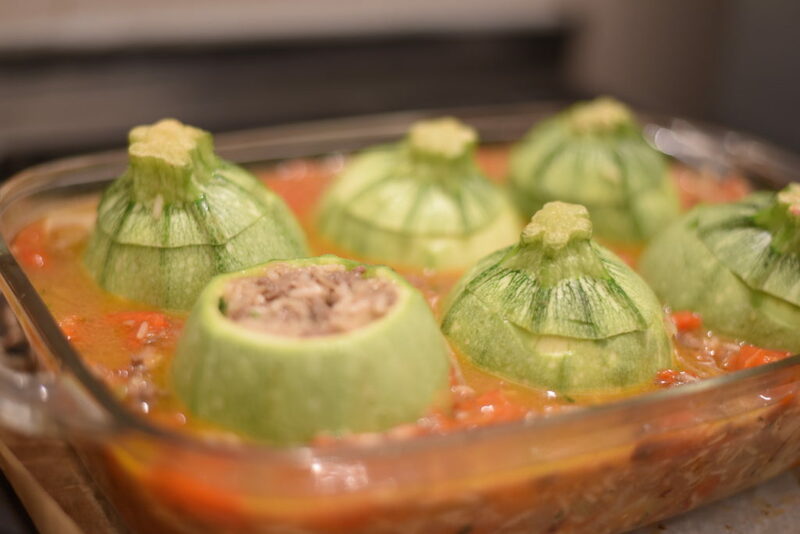 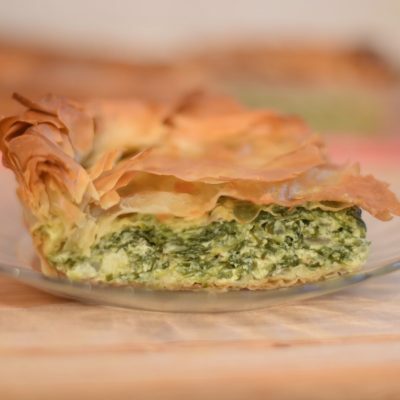 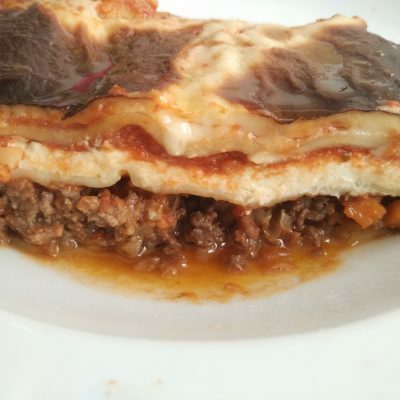 This dish is inspired by the Mediterranean cuisine, in which, filled vegetables is like a national sport, almost every vegetable can be filled, regardless of its shape and size. 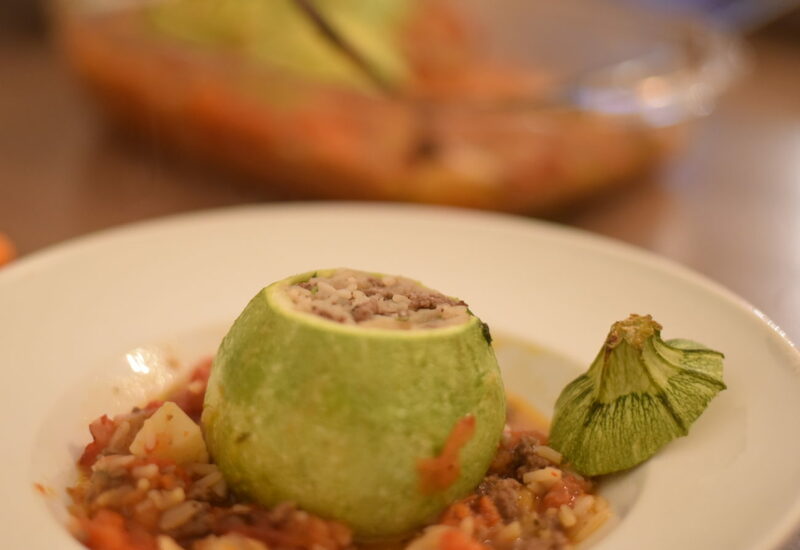 The most common dish in this category is of course the stuffed vine leaves which are usually filled with ground beef and rice, its a popular dish which is a must entry course in the Greek and Arab kitchens all over the Mediterranean’s. 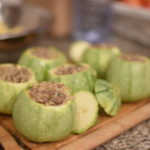 The Moroccans for example, will stuff almost every available vegetable, you can find stuffed zucchini, eggplant, onions, cabbage, cauliflower (yes cauliflower) and basically whatever you can think of. 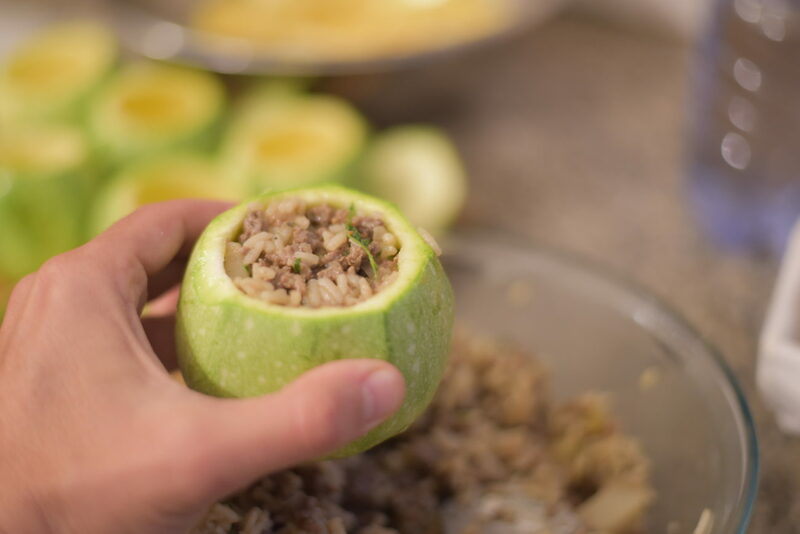 The process of making the stuffed zucchini is not difficult but it takes a bit of work since we have to work both on the filling mix and on the vegetable separately. 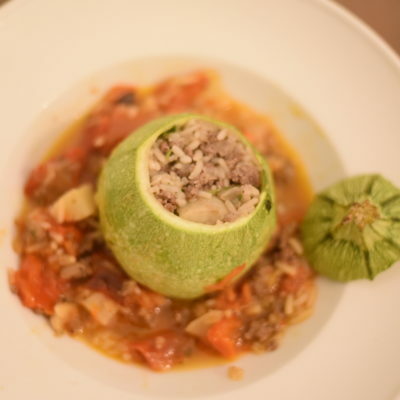 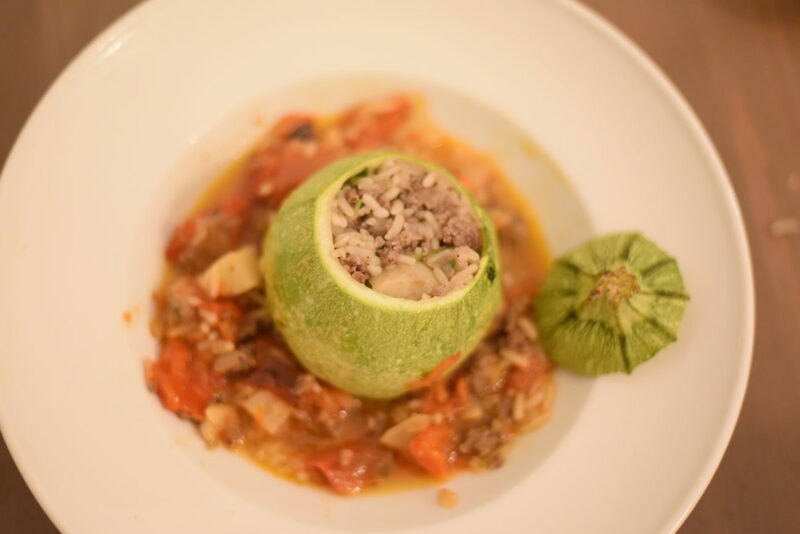 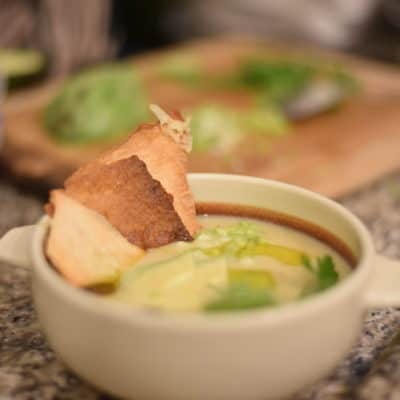 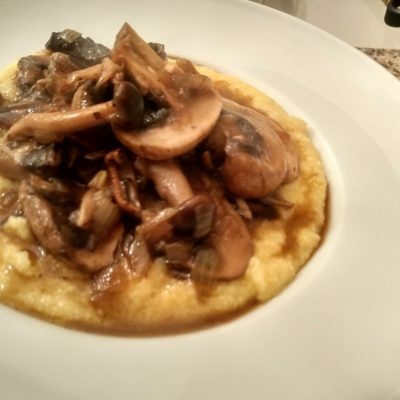 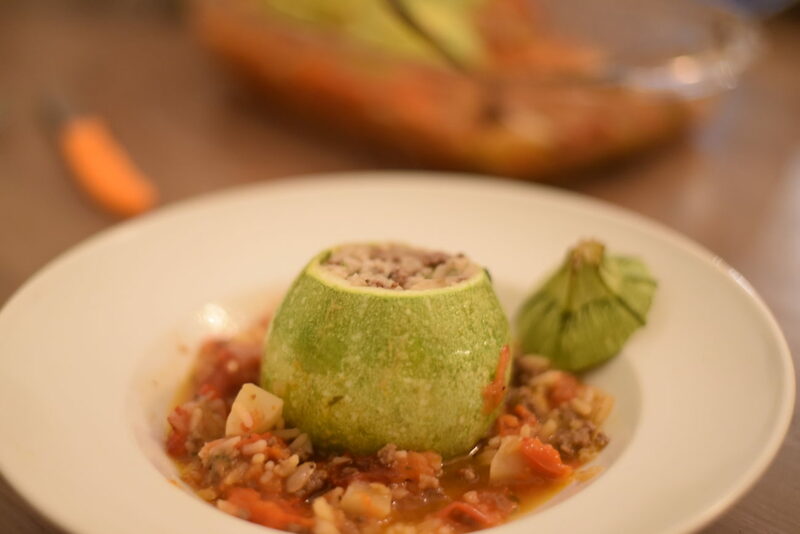 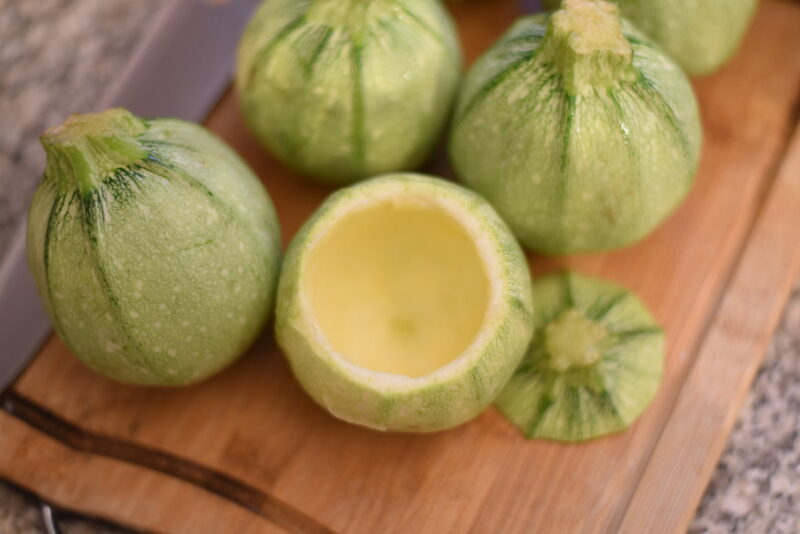 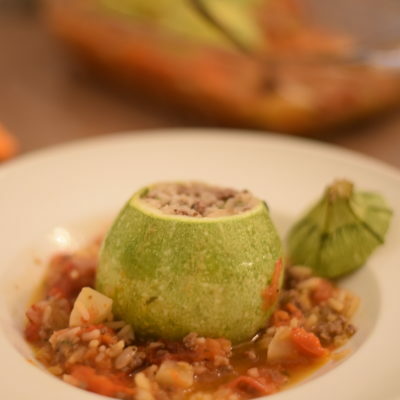 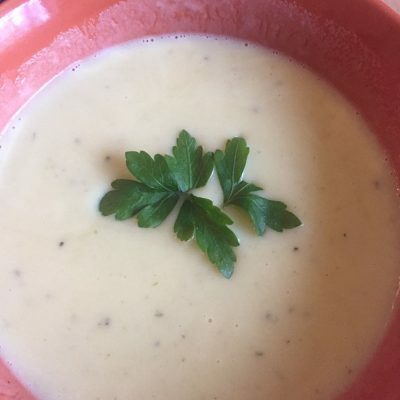 In this recipe i used the round ball shape zucchini which are called Round De Nice, they have soft flesh and they are fairly easy to work with. 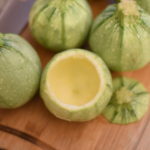 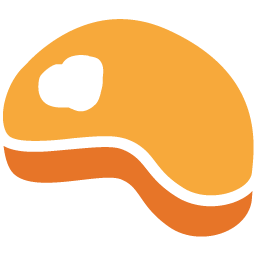 The inner flesh peels out pretty easily and stuffing them is comfortable. 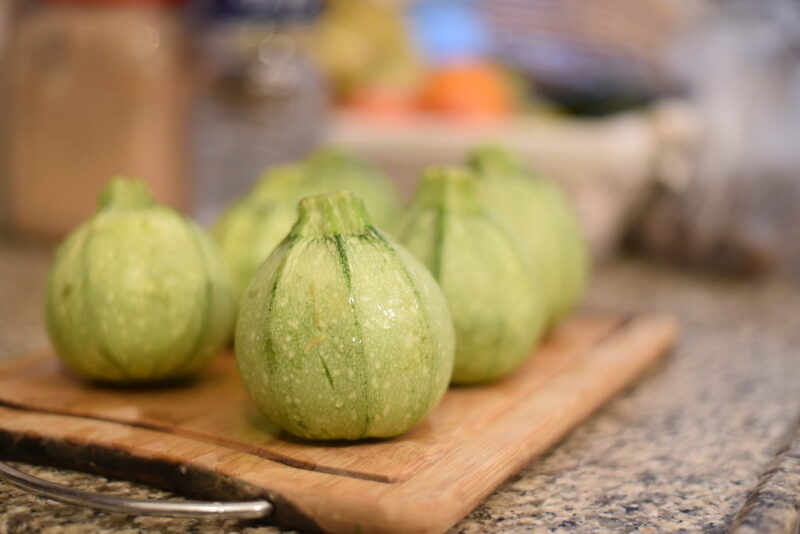 If you can’t find this kind, the regular zucchinis will do just fine. 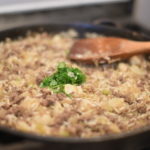 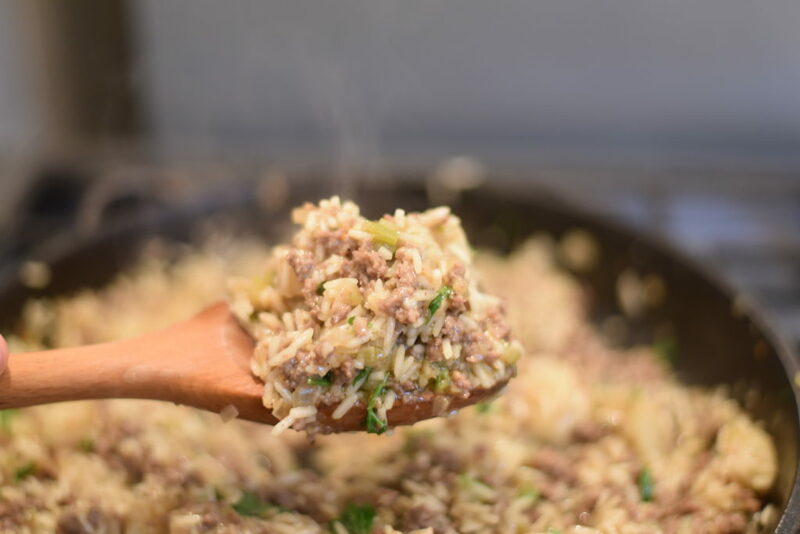 The ground lamb and rice are cooked together and while the lamb is cooked all the way the rice is only half cooked, it will continue its cooking process in the oven. 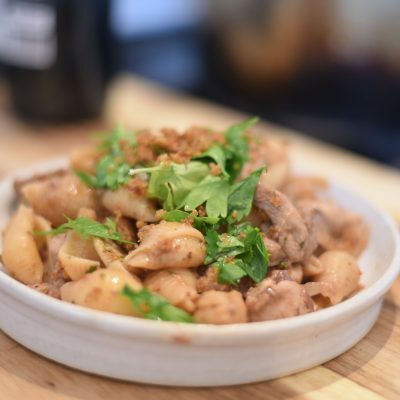 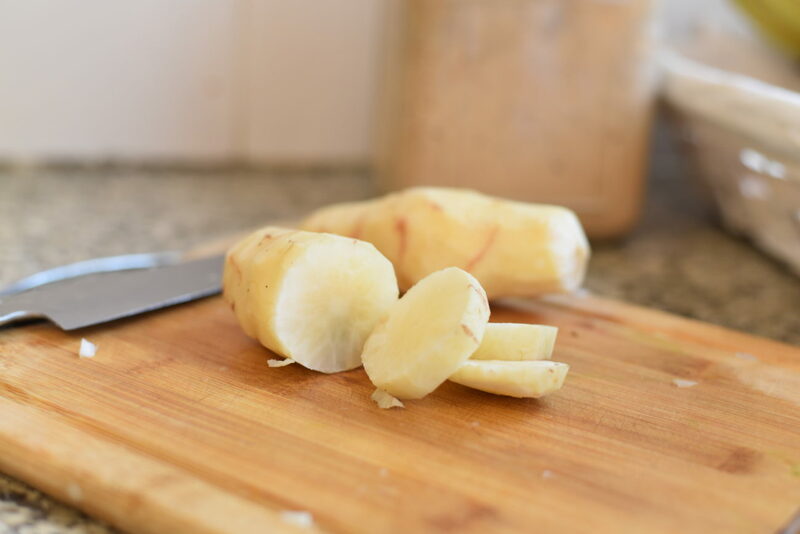 I also added Jerusalem artichoke, they add so much flavor and texture to the dish, definitely worth the time and effort in getting them. 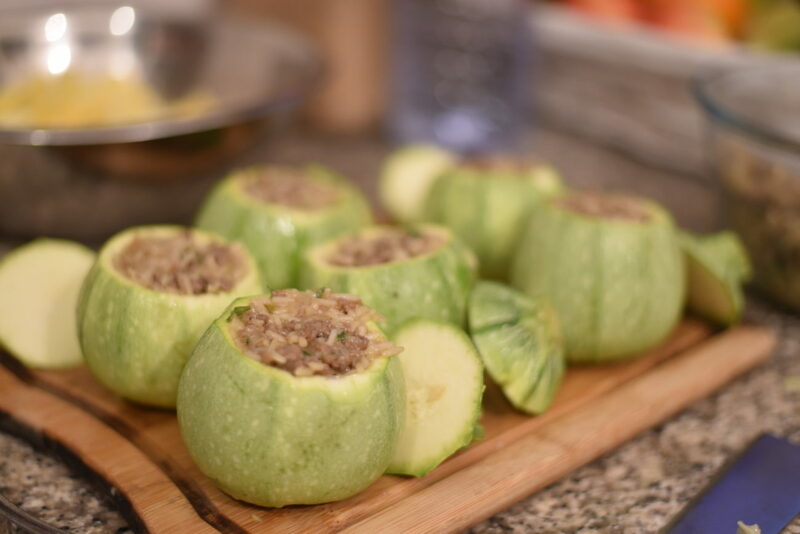 Make sure not to over stuff your zucchini, remember the rice will double its size in the second cooking, if the stuffing is to tight there is a real chance it will tear up the zucchini when cooked. 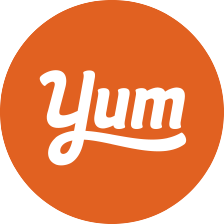 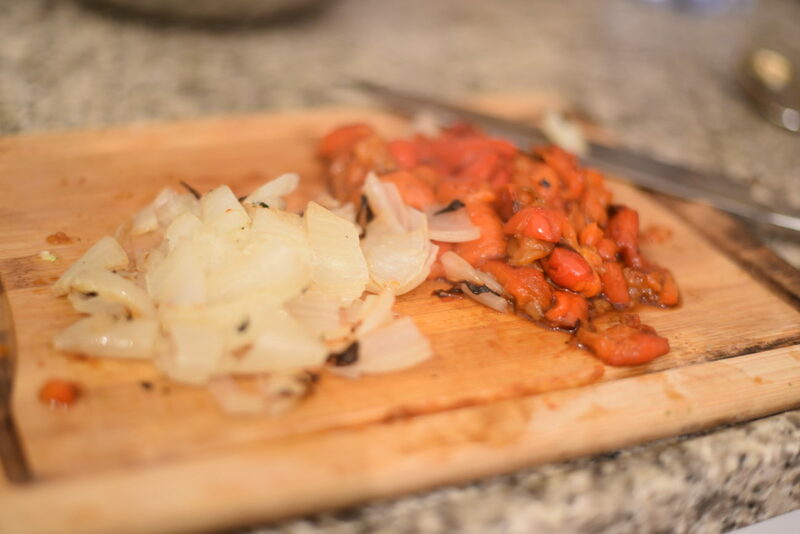 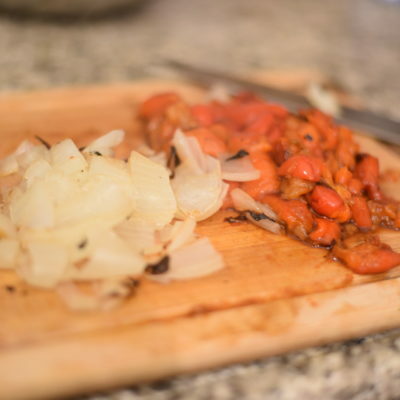 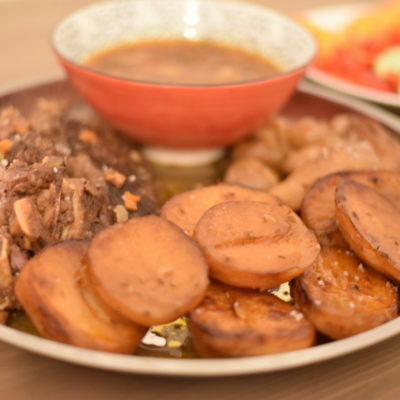 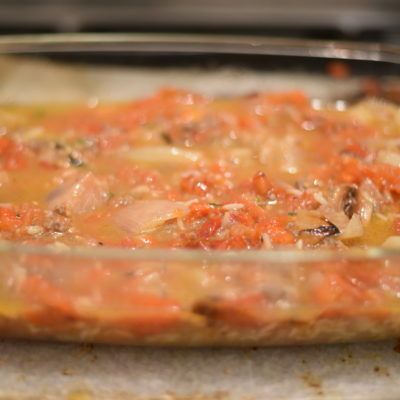 For the sauce, we use roasted vegetables, the slightly burnt tomatoes, bell peppers and onions give the dish a strong campfire rustic flavor, as always with stuffed vegetables, a regular tomato sauce will do just fine if you don’t have the time to make the roasted vegetables. 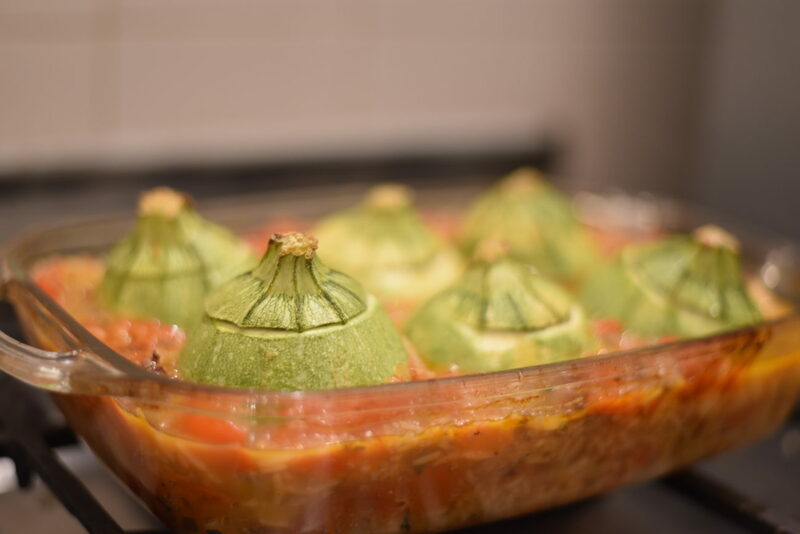 Besides the preparation of the zucchinis, you can make all the ingredients in advance, when ready just work on the zucchinis and throw into the oven. 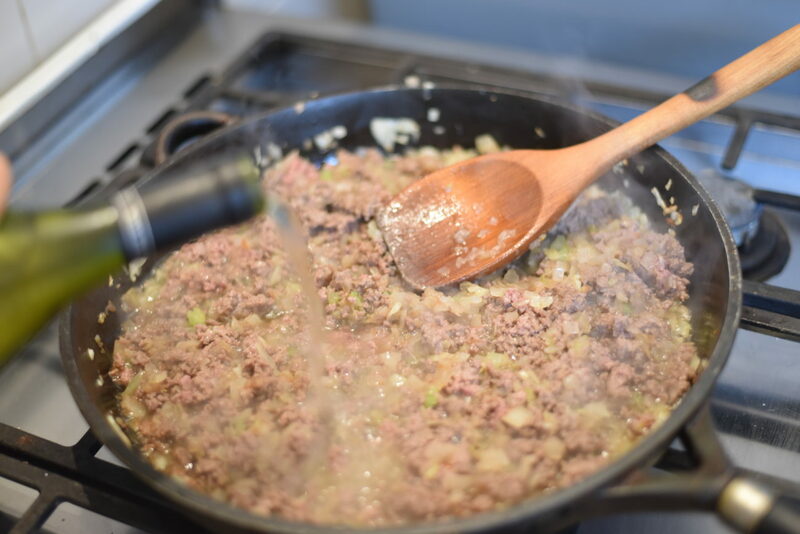 Bring a medium saucepan with water to a boil. 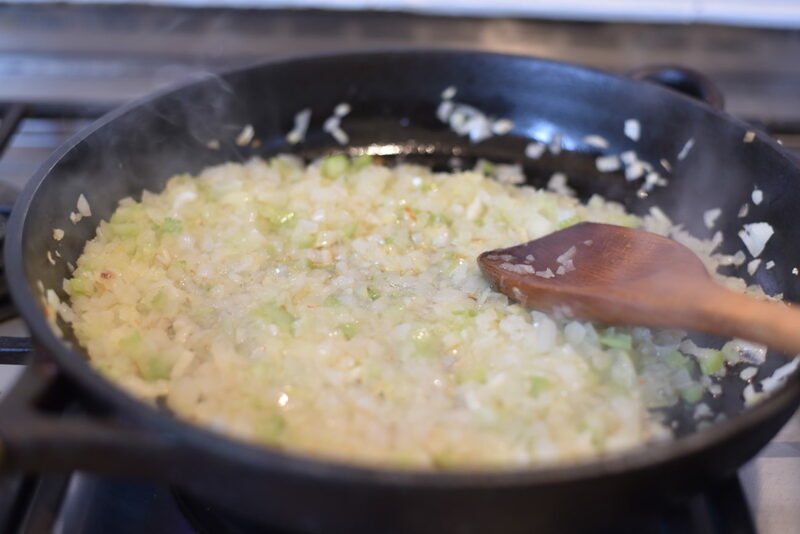 Peel the artichokes and cook for 20 minutes, they will still be a bit stiff, it’s OK.
Cut the artichokes into small cube like pieces and set aside. 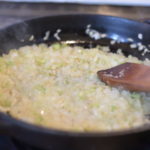 Heat a large cast iron skillet for about 4 minutes, add the onions, cook for 2-3 minutes, add the vegetable oil and diced celery, cook for another 3-4 minutes until golden brown. 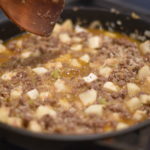 Add the ground lamb breaking it with a wooden spoon, add the cubed artichokes, pour the soy sauce and cook for another 3 minutes. 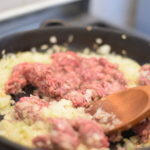 Reduce heat to medium low, add the za'atar, parsley and season with paprika, cinnamon, black pepper and salt. 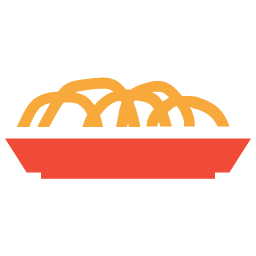 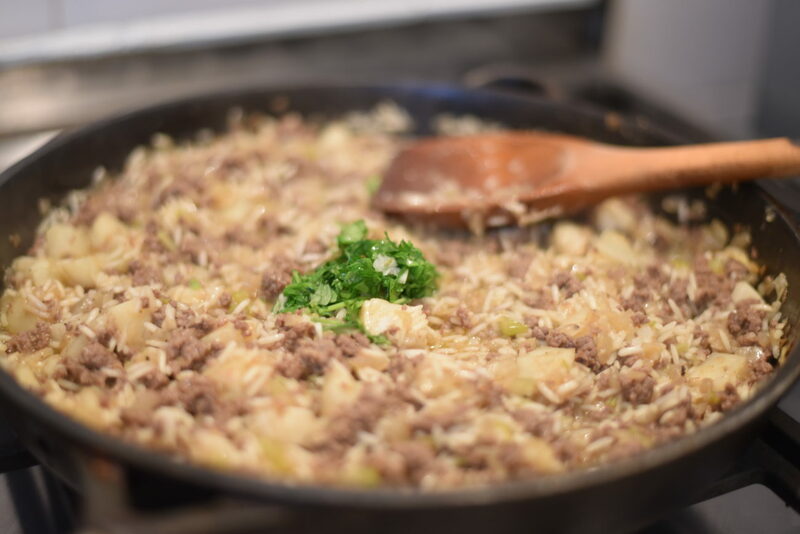 Cook for another 3 minutes and add the rice, mix and pour in the water, reduce heat to low and cook for about more 10 minutes until the water evaporates completely. 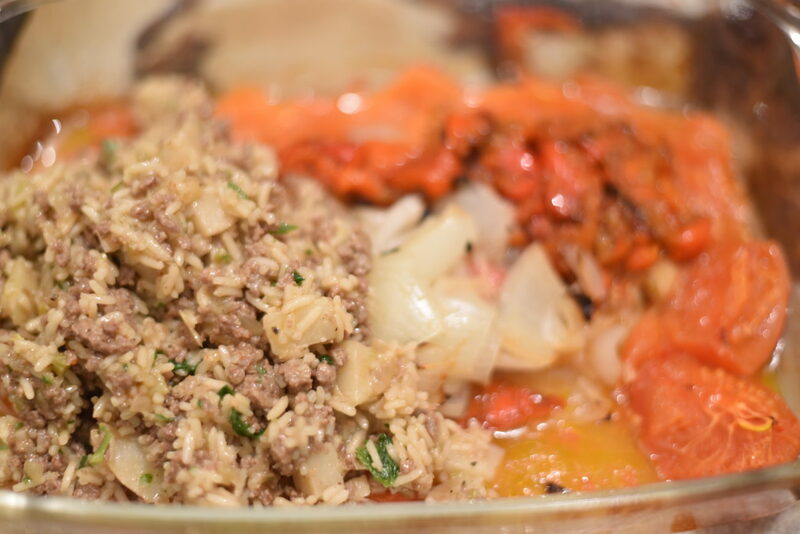 At this point, the rice will be half cooked. 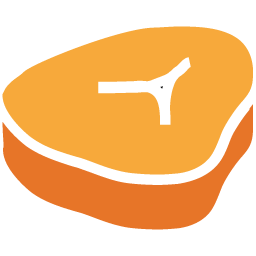 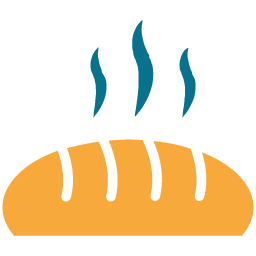 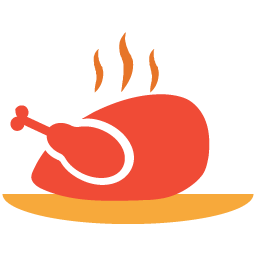 Preheat your oven to 250c/ 500F. 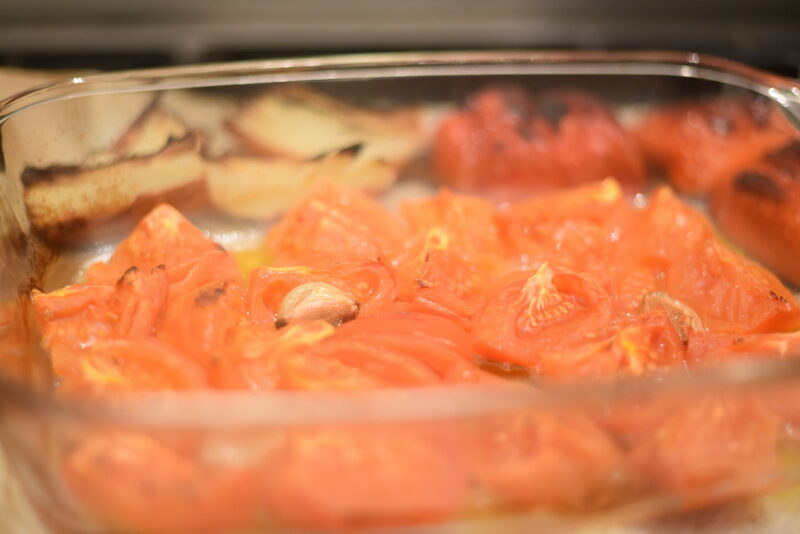 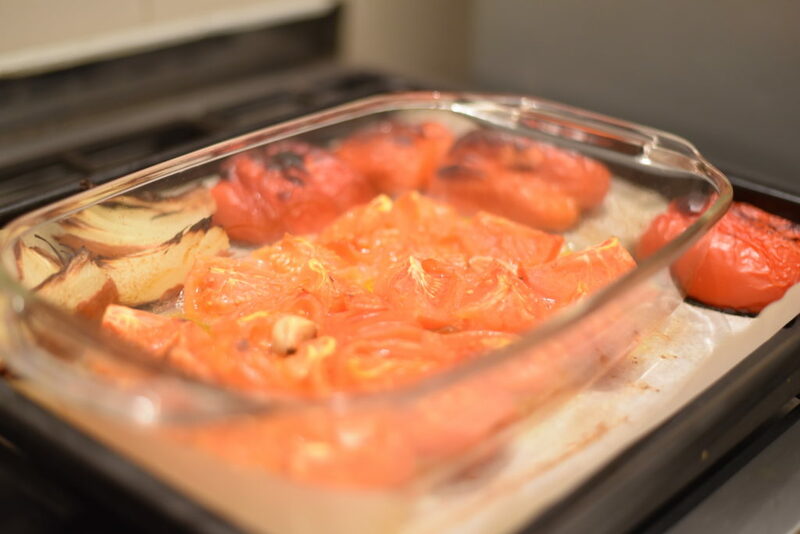 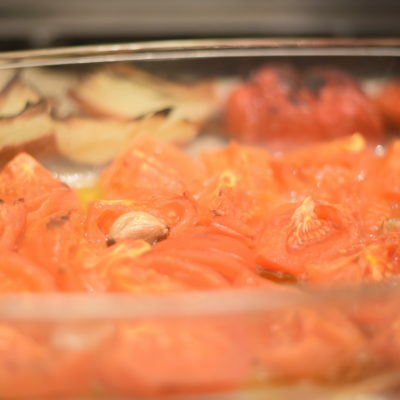 Place the halved tomatoes in a heatproof container (we want to keep all the tomatoes fluids) and set on a baking tray. 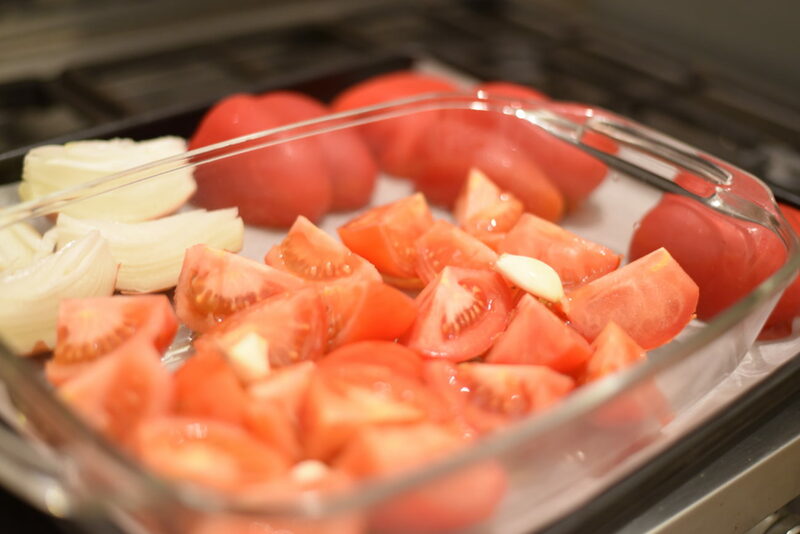 Add the bell peppers and onion to the baking tray on the sides of the tomato container, sprinkle with olive oil and place in the oven for about 40 minutes until well roasted. 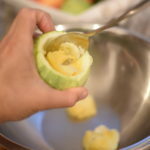 Remove the top of the zucchini, keep it aside it will be the lid of the zucchini. 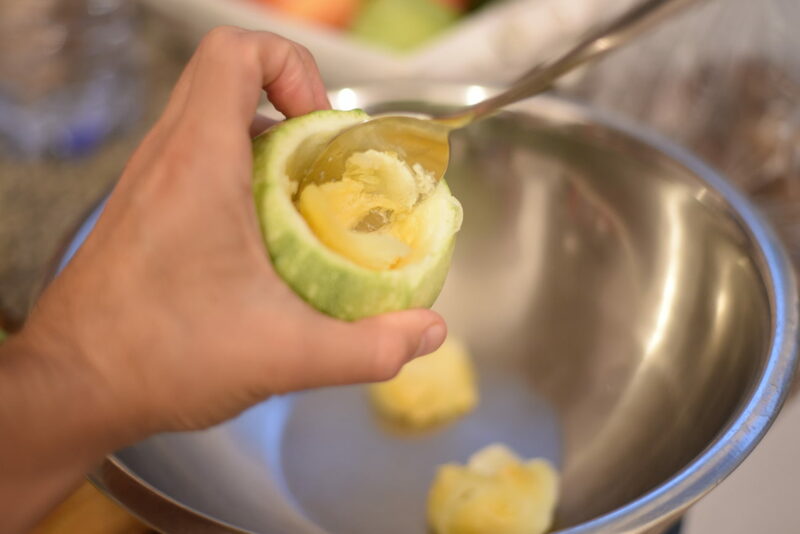 With a regular spoon remove the inner flesh of the zucchini creating a hollow vegetable with about 1/2-inch sides. 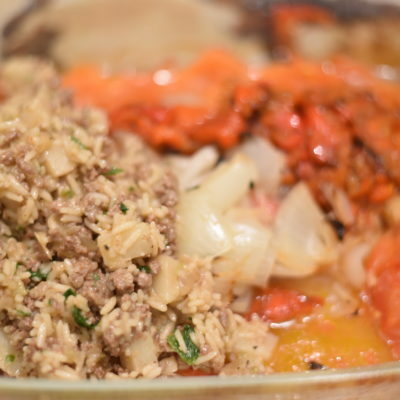 Mix the rice and lamb with half of the roasted tomatoes and stuff the zucchinis, make sure not to over press the vegetable because the rice will puff a bit during the baking time. 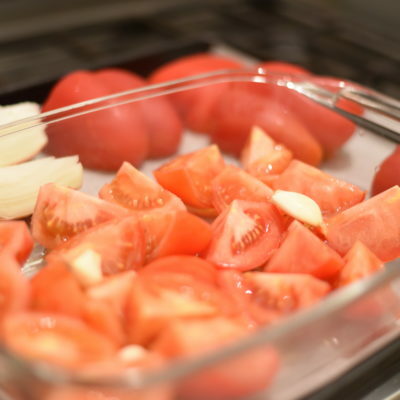 Dice the remaining roasted tomatoes, bell peppers and onions roughly, add 2 tablespoons of tomato paste, 1 cup of water, mix to incorporate and season with salt. 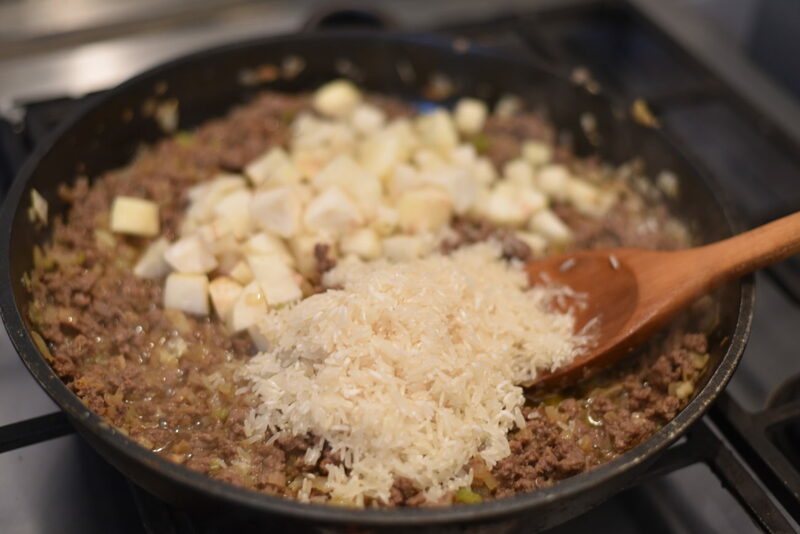 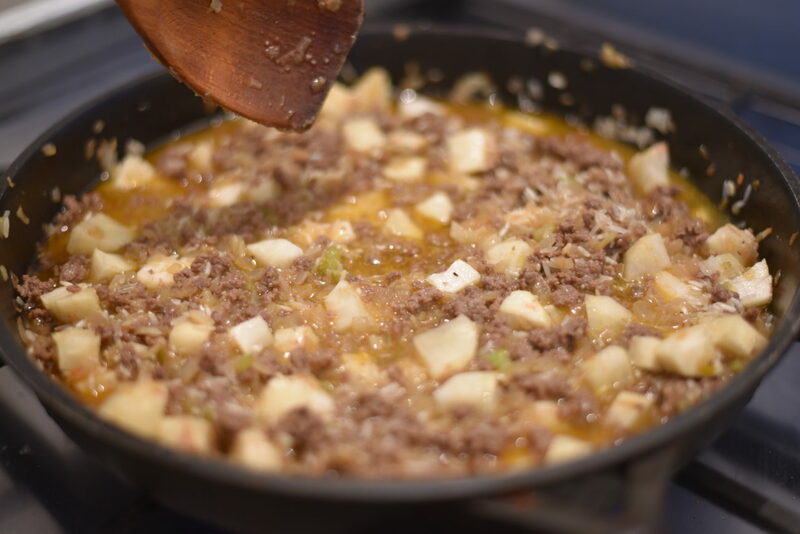 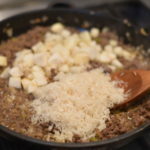 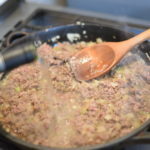 Add the remaining ground lamb and rice mixture to the sauce and pour it into a heatproof baking pan. 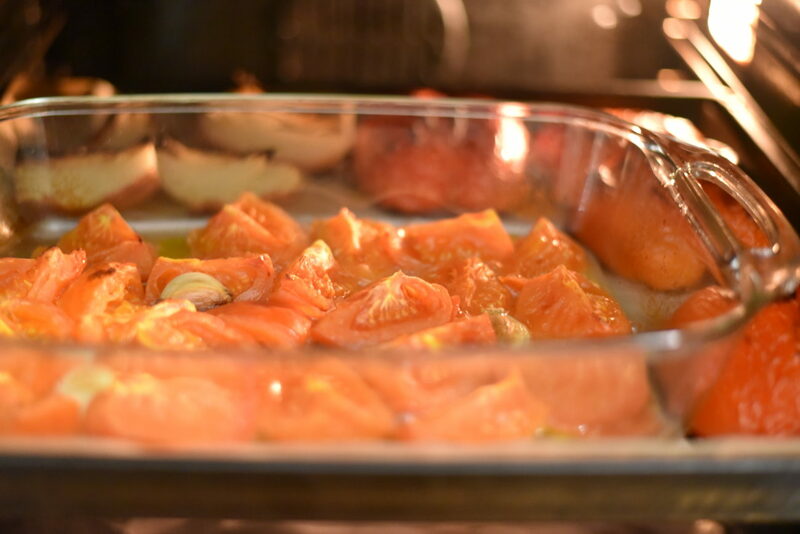 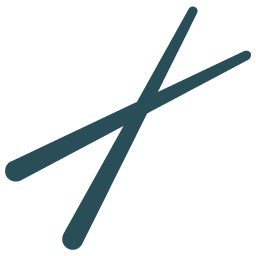 Preheat your oven to 180c/ 350F. 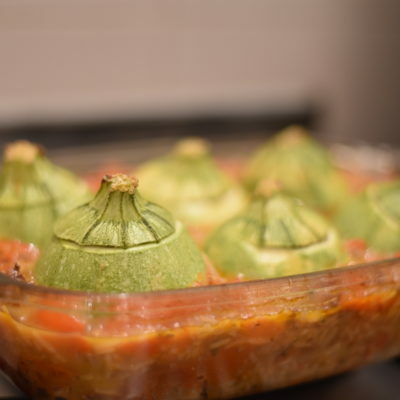 Arrange the stuffed zucchinis in the baking pan, the sauce should be covering about 1/2 of the zucchinis. 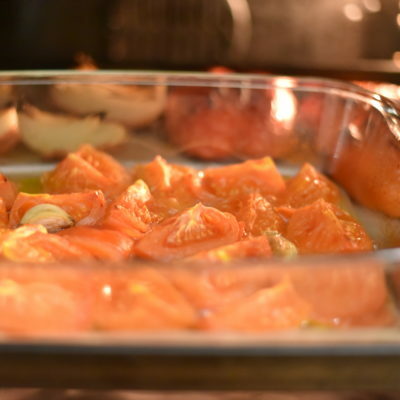 Bake for one hour and set aside to cool.